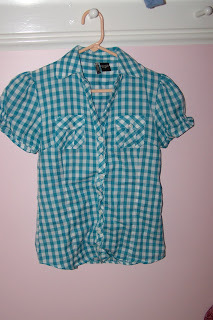 The other day, my sister came home with this cute cowgirl-ish shirt from Marshalls. I thought it was really, really cute and fun. 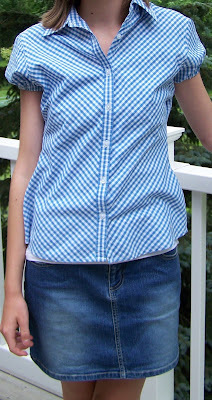 When my mom saw it, she said “Hey, our neighbor just gave us a shirt like that from their garage sale.” When I got the shirt out, it was just a plain old blouse, but with blue stripes on it (sorry no photo). Then, I got the idea that I could maybe take in the sides and put elastic around the sleeves and it would look more like my sister’s shirt. Since I want to be a fashion designer, I went up into my fake fashion design studio where I have tons of Project Runway kits and sketching books (although, I have never seen the show, due to the lack of our t.v. channels), and sketched what my idea would be for the shirt. I did it kind of fast, so it was not my best sketch, but it still was adequate. I showed it to my mom, told her my ideas, and then she said that it could most likely be fixed/changed around. So I did everything I thought might work (with the help from my mom) and it turned out great!! I was so happy. We wished we could have done a before picture, but I had already started sewing before my mom told me we should have done that.